I am on the road (hence the random comment moderation and short posts). Somehow I thought internet access would be continuous, but I have been forced to go to great lengths and expense to get occasional access. Next week might be better. Or not. In the meantime, the photo shows some graffiti I saw today. Rebelling against a puritanical society? Seems Dutch. Is this in The Netherlands? Ooh, France? I want to be where you are. I had so much trouble finding wifi while traveling in France. Have a great trip. It looks like a graffiti you could find in Jussieu, the University of the Latin Corner. If I'm right, I am a bit jealous (for the Latin Corner more than Jussieu, which is not very fancy for the most part). so who's right? the Netherlands or France? Perhaps you could give us an extra clue with your next posting! I wonder if this particular stencil graffiti occurs in more than one place. We could make a Google Earth map of the known locations. Wouldn't you know I found a picture of the exact same graffiti at the same spot as your photo by doing a little bit of searching. The word just to the left of the stencil is RIOT and it's a narrow little street that doesn't allow cars, motorcycles or bikes. Not France. Still wish I was there. I've never been to that country. @FSP, I don't think its the stencil format, but more the spelling of the word. Although it's not correctly spelled when Dutch (should officially be 'seksisme'), this is the popular spelling. A quick googling reveals that it is (correct) French. I have seen this stencil graffiti in Barcelona, my home town. The words belong as well to the Catalan language, spoken by about 10 million people. It appears to be in Sion, a town in the French speaking part of Switzerland. It is about 28000 people, no wonder you have trouble finding wifi. What? Where do these guesses come from? I see nothing in the picture that could reveal more than a region of a country, if that. but guessing the location of this snapshot really does seem impossible, even knowing which conference FSP might be attending. 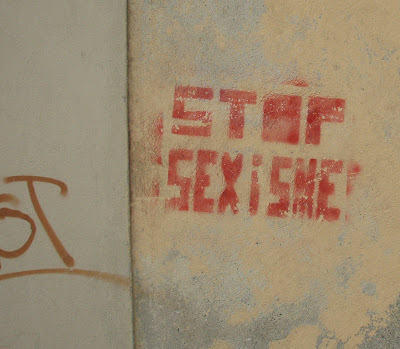 Just google "stop sexisme" and go into images... you'll see the exact same picture. Where does procrastination lead me? Amazing. I suppose Googling will only get more complete and easy to access. Time to quit keeping secrets.